Flushing-Main Street bound 7 train at Queensboro Plaza. Resized photo courtesy of Eye On Transit. 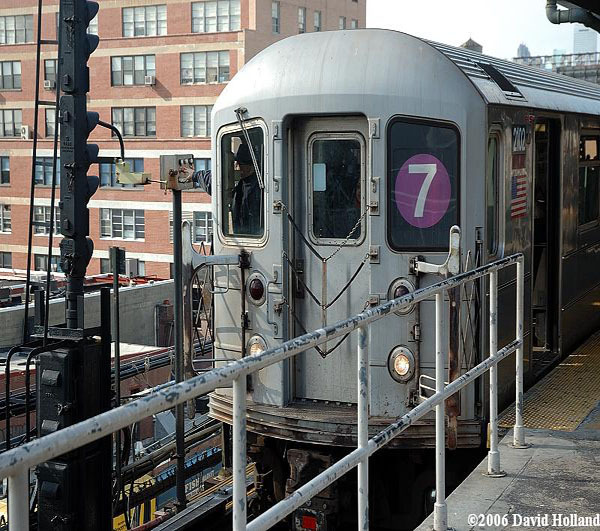 The much maligned 7 line extension is a topic I have blogged about extensively since 2006. For those who don’t recall, I was strongly against this project as I accurately feel there are more pressing projects that need to be done in terms of expansions to our system. The city will spend $46 million next year on a subway to nowhere – the first time taxpayers have put cash toward Mayor Bloomberg’s dream of extending the 7 train to the far West Side. Bloomberg budgeted $300 million for the subway project over the past five years but never spent any of it. Developer fees and investment income had paid the interest on bonds financing the $2.1 billion extension. Next year, however, Hudson Yards Infrastructure Corp. President Alan Anders expects the city will cover half the $97.5 million interest cost. He said the project is on time and under budget, with 60% of the contracts already signed. A proposed second station at 41st St. and 10th Ave. was abandoned to save money, though the Real Estate Board of New York has sought federal funds for it.